Originally posted on June 14th, 2016 on Medium. In most university settings, students have few opportunities to add value to businesses through their coursework. Most student projects are not used by anyone once the course is over. Without the opportunity to work with businesses until they graduate, students remain unprepared for the workforce. In fact, a 2014 Gallup poll reported that only 14% of employers strongly agreed that recent college graduates have the necessary skills to be successful in the workplace. This system disadvantages both students and businesses. 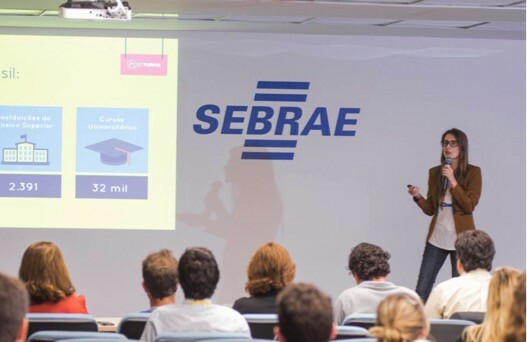 Based in Brazil, InTurma seeks to solve this problem by facilitating new levels of exchange between universities and businesses. Through an online platform that matches student skills with business needs, InTurma aims to promote inclusive and sustained economic growth by preparing students to enter the workforce and solve real business challenges. AMANDA PITCHES AT THE SGB LAB. As an undergraduate broadcast journalism student in Florianopolis, Brazil, Amanda Busato was frustrated that too many of her school projects had no practical business use. The class projects she completed did not allow her to develop project management skills or work to solve business challenges. In response to this observation, Amanda decided to write her university thesis to be an analysis of the communication system at the company for which she was an intern. In addition to fulfilling her university requirements, Amanda acquired valuable experience working for a real business — and the company benefited from her project. This experience exposed Amanda to a gap in the market: There was no easy way for businesses and students to collaborate on projects so that university students could earn credit and businesses could gain the value of students’ input. She came up with the idea for an online hub that would enable students to meet real business demands. She named her budding business InTurma. InTurma began to take shape when Amanda participated in the 2015 Social Good Brazil (SGB) Lab. 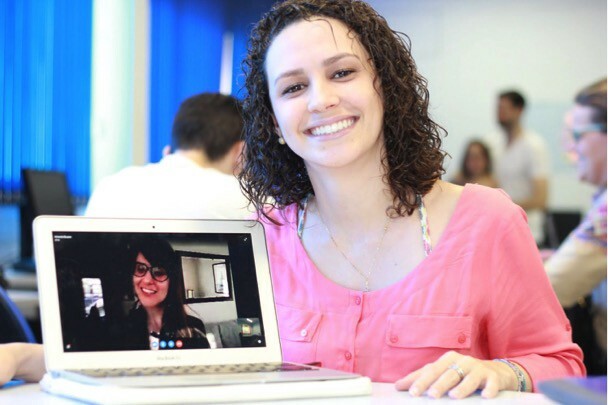 While there, Amanda built the InTurma online platform and launched a pilot program at a university in Florianopolis. Within a few months, 66 businesses and 385 students registered on InTurma. Although the pilot demonstrated that the program worked well, Amanda struggled to grow InTurma while maintaining its freemium business model. She partnered with another SGB Lab participant, Mayra Mezzomo, to expand the InTurma network. In December 2015, Amanda and Mayra participated in the GSBI SGB Boost, adapted from Global Social Benefit (GSBI) material developed at Miller Center for Social Entrepreneurship and made possible through the support of eBay Foundation. MAYRA AND AMANDA (VIA SKYPE) AT BOOST. The GSBI SGB Boost program enabled Amanda and Mayra to take the InTurma methodology validated in the SGB Lab and turn it into a more structured business plan. Evaluating InTurma’s value chain and expansion costs during the financial module of the GSBI SGB Boost program prompted Amanda and Mayra to rethink their outreach strategy to scale successfully. They realized that their original approach — using their personal networks to promote InTurma with universities and businesses — would cost too much over the long term. - To keep client acquisition costs down, Amanda and Mayra established an ambassador program where students and professors promote InTurma on their university campuses. - Using the financial template from the GSBI SGB Boost program, they calculated that InTurma would need 17,000 BRL per month (about 4,200 USD) to expand and continue everyday operations. -Amanda and Mayra are strengthening relationships with businesses and organizations to assess which student skills would be most helpful..
-They are finalizing InTurma’s online platform and seeking seed funding. InTurma now has a strong footing for its next developmental phases and a clear strategy for success. Allie Grasgree. Ready Or Not: Are College Graduates Prepared for the Workforce? Inside Higher Ed, 2014.